Phil has been hooked on dinosaurs since the age of 3. 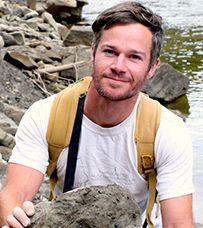 He now runs digs in western Canada where he is co-leader of the Northern Alberta Dinosaur Project and more locally in Lightning Ridge (NSW) exploring the Cretaceous ecosystems. He is an authority on "duck-billed" hadrosaurid dinosaurs and dinosaur skin, although his research covers a wide range of dinosaurs and other Mesozoic vertebrates. Dinosaur evolution, behaviour, and palaeoecology. Dinosaur skin, its morphology, preservation, and taxonomic implications. Cretaceous palaeoecology and dinosaur faunas of Australia, particularly from Lightning Ridge, NSW. For a full list of publications, please visit Dr Bell's Google Scholar or Academia.edu profile. Prieto-Marquez, A., Wagner, J.R., Bell, P.R., Chiappe, L.M. (2015). The late-surviving 'duck-billed' dinosaur Augustynolophus from the upper Maastrichtian of western North America and crest evolution in Saurolophini. Geological Magazine 152:225–241. Bell, P.R., Currie, P.J. (2014) Albertosaurus (Dinosauria: Theropoda) material from an Edmontosaurus bonebed (Horseshoe Canyon Formation) near Edmonton; clarification of palaeogeographic distribution. Canadian Journal of Earth Sciences 51:1052–1057. Eberth, D.A, Bell, P.R. (2014) Stratigraphy of the Danek Bonebed (Upper Cretaceous Horseshoe Canyon Formation, central Alberta) and correlations with strata in the Drumheller and Grande Prairie regions. Canadian Journal of Earth Sciences 51:975–981. Bell, P.R., Campione, N.E. (2014). Taphonomy of the Danek Bonebed: a monodominant Edmontosaurus (Hadrosauridae) bonebed from the Horseshoe Canyon Formation, Alberta. Canadian Journal of Earth Sciences 51:992–1006. Bourke, J.M., Ruger Porter, W.M., Ridgely, R.C., Lyson, T.R., Schachner, E.R., Bell, P.R., Witmer, L.M. (2014). Breathing Life into Dinosaurs: Tackling Challenges of Soft-Tissue Restoration and Nasal Airflow in Extinct Species. Anatomical Record 297:2148–2186. Bell, P.R., Sissons, R., Burns, M.E., Fanti, F., and Currie, P.J. (2014) New hadrosaurine material from the upper Campanian Wapiti Formation, west-central Alberta. In D.A. Eberth and D.C. Evans (eds.) The Hadrosaurs: Proceedings of the International Hadrosaur Symposium. Indiana University Press, Bloomington and Indianapolis, pp. 174–190. Bell, P.R. (2014). A review of hadrosaurid skin impressions. In D.A. Eberth and D.C. Evans (eds.) The Hadrosaurs: Proceedings of the International Hadrosaur Symposium. Indiana University Press, Bloomington and Indianapolis, pp. 572–590. Xing, L., Li, D., Harris, J.D., Bell, P.R., Azuma, Y., Fujita, M., Lee, Y.-N., and Currie, P.J. (2013) A new deinonychosaurian track from the Lower Cretaceous Hekou Group, Gansu Province, China. Acta Palaeontologica Polonica 58:723–730. Bell, P.R. and Brink, K. (2013) Kazaklambia convincens comb. nov., a primitive juvenile lambeosaurine from the Santonian of Kazakhstan. Cretaceous Research 45:265–274. Xing, L., Persons, W.S., Bell, P.R., Xu, X., Zhang, J., Miyashita, T., Wang, F., and Currie, P.J. (2013). Piscivory in the feathered dinosaur Microraptor. Evolution 67:2441–2445. Xing, L, Bell P.R., Rothschild, B.M., Ran, H., Zhang, J., Dong, Z., Zhang, W., Currie, P.J. (2013) Tooth loss and alveolar remodelling in Sinosaurus triassicus (Dinosauria: Theropoda) from the Lower Jurassic Strata of the Lufeng Basin, China. Chinese Science Bulletin 58:1931–1935. Fanti, F., Bell, P.R., and Sissons, R. (2013). A diverse, high-latitude ichnofauna from the Late Cretaceous Wapiti Formation, Alberta, Canada. Cretaceous Research 41:256–269. Bell, P.R., Fanti, F., Acorn, J., and Sissons, R. (2013) Fossil mayfly larvae (Ephemoptera, cf. Heptageniidae) from the Late Cretaceous Wapiti Formation, Alberta, Canada. Journal of Palaeontology 87:146–149. Bell, P.R., Fanti, F., and Sissons, R. (2013). A possible pterosaur manus track from the Late Cretaceous of Alberta. Lethaia 46:274–279..
Xing, L., Bell, P.R., Persons, W.S., Ji, S., Miyashita, T., Burns, M.E., Ji, Q., and Currie, P.J. (2012) Abdominal contents from two large Early Cretaceous compsognathids (Dinosauria: Theropoda) demonstrate feeding on confuciusornithids and dromaeosaurids. PLoS ONE 7(8): e44012. Xing, L., Bell, P.R., Harris, J.D., and Currie, P.J. (2012) An unusual three-dimensionally preserved, large hadrosauriform pes track from the 'mid' Cretaceous Jiaguan Formation of Chongqing, China. Acta Geologica Sinica 86:304–312. Xing, L., Bell, P.R., Currie, P.J., Shibata, M., Tseng, K., and Dong, Z. (2012) A sauropod rib with an embedded theropod tooth; direct evidence of feeding behavior in the Jehol Group, China. Lethaia DOI: 10.1111/j.1502-3931.2012.00310.x.